How to Set Up GSA Captcher Breaker with ScrapeBox? — . :: GSA SEO & Marketing Forum ::. 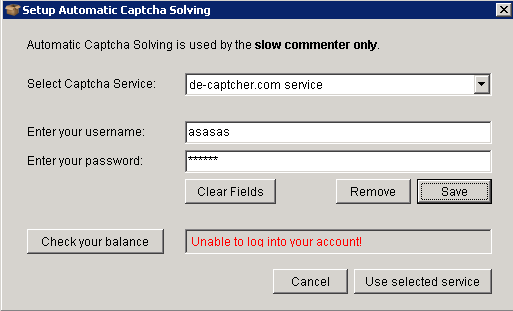 How to Set Up GSA Captcher Breaker with ScrapeBox? I've added as below using a random user and password. I've then clicked on Use selected service. 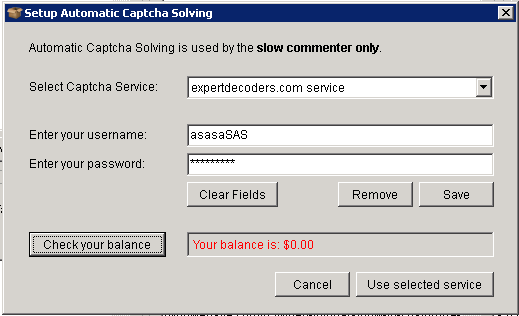 Captcha Sniper was always showing 777$ or 1000$ balance, but If u r unsure, disable everything else that is using your captcha, run scrapebox and see if there is anything in CB. Nope CB not working with ScrapeBox. What is wrong with my settings as shown above please? use some other service in Scrapebox and make sure webserver is checked in CB + 0.0.0.0 or 127.0.0.1 as IP with port 80. ...and clicking Test is working for you? Any suggestions how to set up a test in ScrapeBox? 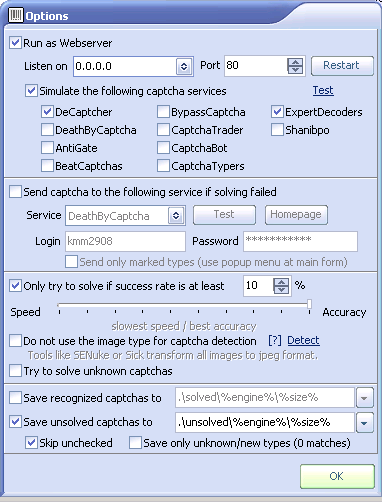 I ran a slow commenter test but not sure its actually requesting any captchas. I switched to deathby and after a few hundred fails my balance hadn't changed. Is it ok to have more than one service checked to be simulated in options? Also is there a manual anywhere or a set of videos? Need to know how to cover set up, general use and how to use the SDK to improve results. If we had a good manual/videos wouldn't need to bug you guys for simple things all the time, hate feeling like an idiot. Fantastic tool but for $117 this should all be included and easy to access IMO. >Is it ok to have more than one service checked to be simulated in options? Me too I have the same problem. How do I solve this?